That was awesome! Maybe if that had been the actual trailer more people would have watched? 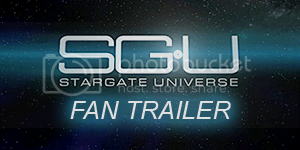 I love SGU soooooo much, and am so bummed they cancelled it. I'm watching the last eps with a half hearted attention because, I just don't want to get anymore invest and be that much more hurt. You really know how to make my day, you know that? :D The original trailer wasn't so bad but it could have been a bit more, I don't know, interesting?